I recently visited China and thought I’d expand on Chris’ series of blog posts about visiting China. If you have 2 days in Shanghai, then Chris is pretty spot on with his recommendations (although I think the Urban Planning Centre is also worth a quick visit). If you are a Disney fan like me and have a bit longer, here are my reflections on the newest addition to the Disney Parks family. 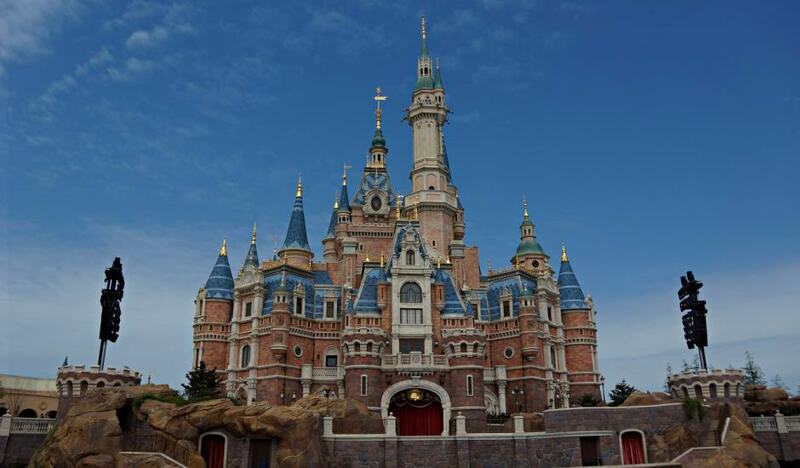 When we visited the Shanghai Disney resort we knew we wanted a Disney option for our accommodation. The park is quite far from the central city (about 45 minutes on the underground) and we knew that as we’d be having long days in the park it would be easier to stay close by. The complimentary transport and guest service standards make staying in a Disney hotel a simple choice. 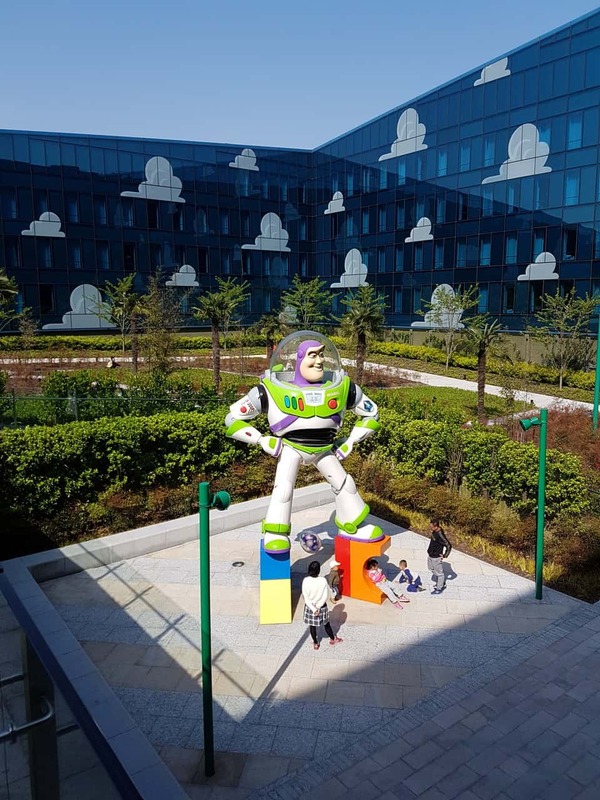 There are two hotels to choose from – the luxurious Shanghai Disneyland Hotel and a more budget friendly Toy Story Hotel (still not cheap). We opted for the Toy Story Hotel because it was unique to anything offered by other Disney parks (we’ve visited them all). When booking be careful to check fluctuations in the nightly rate – when we priced up the holiday we multiplied the cost of a weeknight stay and we had a bit of a shock when we plugged in the final dates and saw the difference in price over the weekend. 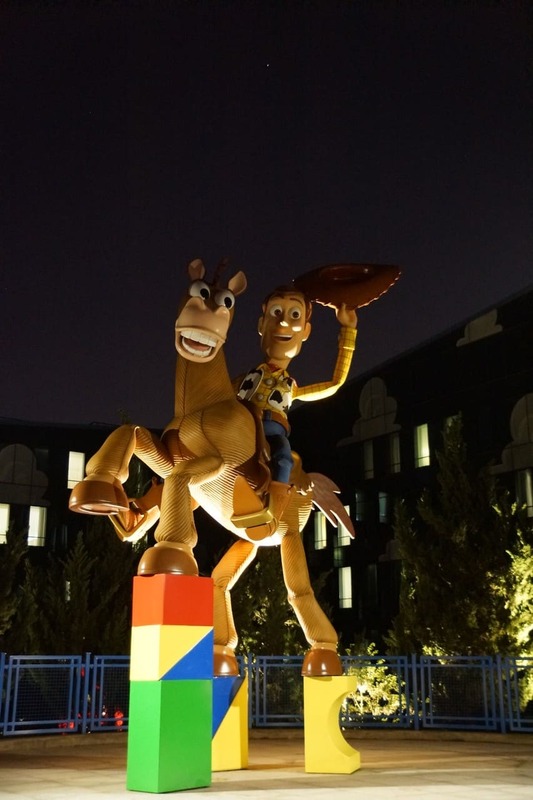 I really enjoyed staying at the Toy Story hotel. It was bright, airy and spacious and not overly themed (although I’m not sure what level it would have to reach for it to be over-themed in my mind). It was close to the park but not walkable so we were reliant on the free Disney transport bus, which ran around every 10 minutes to the park gates and every 15 minutes to the tube station. I don’t remember us ever waiting longer than those times and often a bus arrived shortly after we arrived at the bus stand (in either direction). There were a couple of quick service restaurants in the hotel that offered some good food options and weren’t too busy when we visited them. 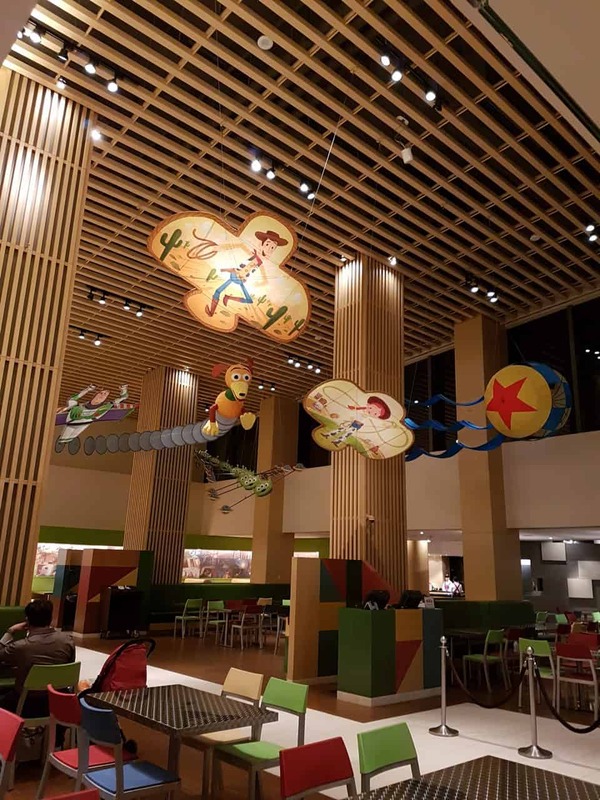 I really like the detail of the Toy Story kites in the main restaurant. The hotel cast members were all very friendly and helpful. They spoke the best English of anywhere we had stayed in China (English is not widely spoken and you should be prepared for language barriers). The best advice I have is to always carry the information you need already translated. 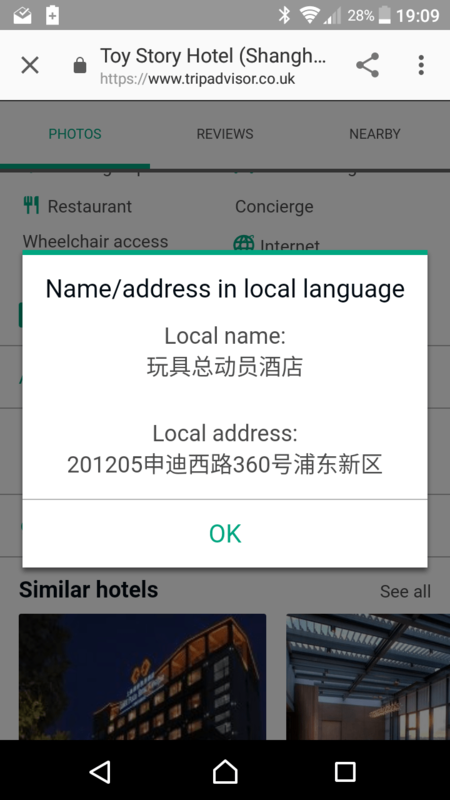 TripAdvisor has an excellent feature that allows you to see the name and address of a hotel, restaurant etc in the local language. Our taxi driver from the train station was pretty lost when we first said ‘Disneyland’ until we showed him the address in Chinese. 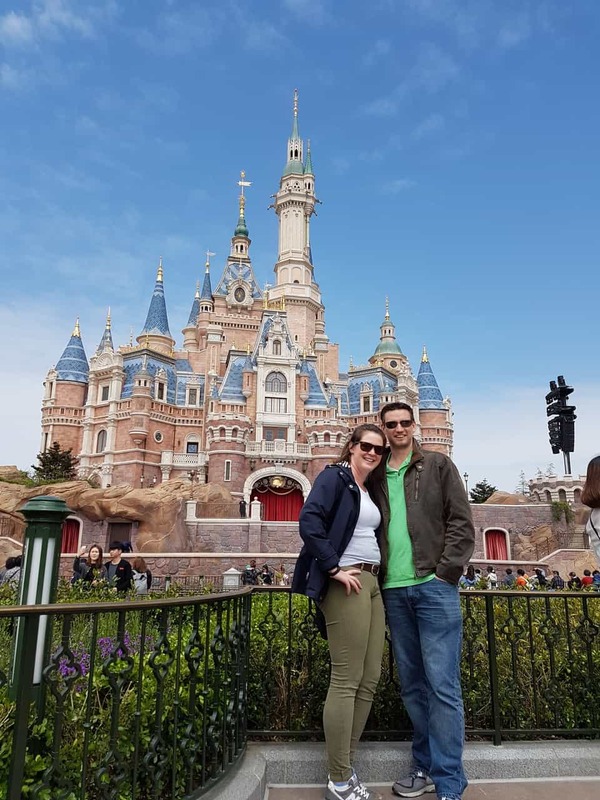 We arrived in Disney in the late afternoon, checked into our hotel and then decided explore Downtown Disney and nose around the Shanghai Disneyland Hotel. 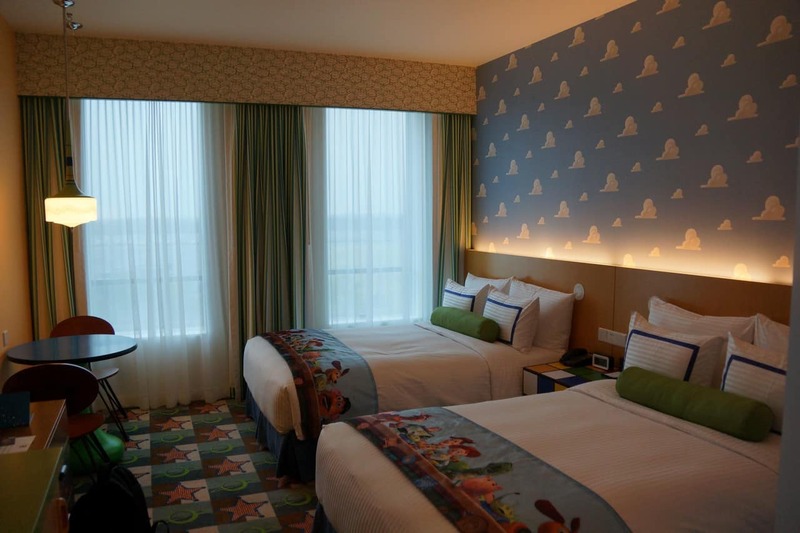 It is as impressive and luxurious as all the other flagship Disney Parks hotels. It’s walkable to the park gates (by my standards but I have a high step tolerance for Disney!) and is also served by a boat and bus. Probably the main reason to stay here is the impressive views of the castle and the expectation of watching the fireworks show (more on that later). 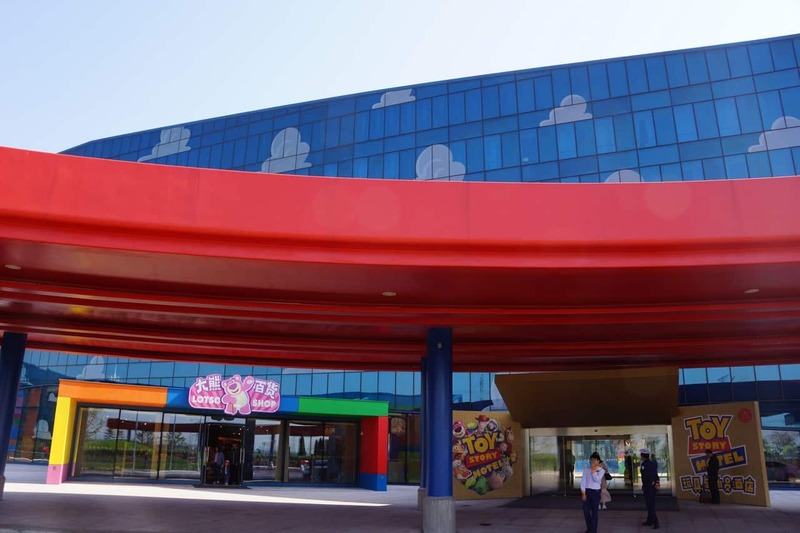 Overall, given the price difference and theming I was pleased we opted with the Toy Story Hotel. We weren’t too inspired by any of the dining options: lots of mainstream Asian options which didn’t compare to the amazing, authentic food we’d been eating during our time in Beijing. However, we then walked around a corner and discovered our all-time favourite American chain restaurant – The Cheesecake Factory. As we were already tourist sellouts in Disney we thought we might as well embrace that by eating in The Cheesecake Factory. Downtown Disney was fairly quiet, especially when we were able to compare it to the crowds we experienced in the parks. Even during peak dining times we didn’t experience long wait times for tables. The retail stores were easy to navigate and there were no long queues at the checkouts. I’m an early riser and a planner when it comes to visiting theme parks. 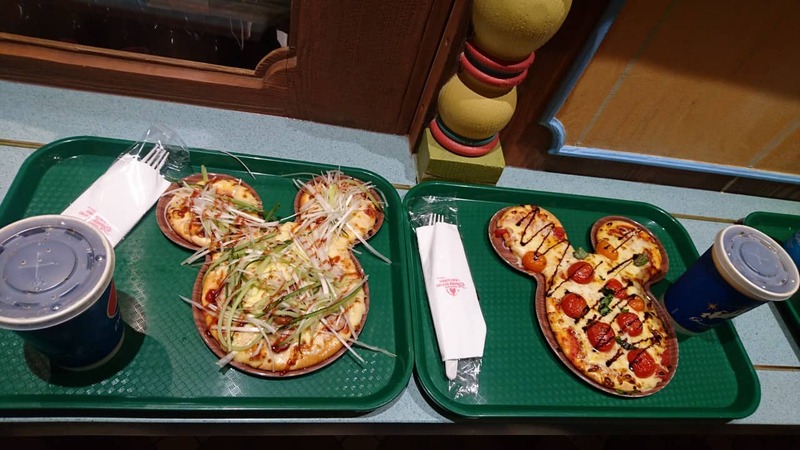 I found the planning a bit difficult for Shanghai Disney. 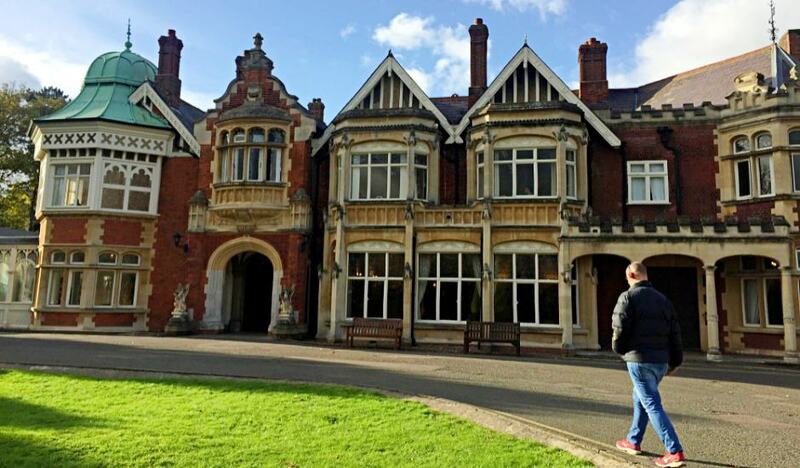 We visited within its first year of being open and not much information had been published about visiting the park apart from the official website. 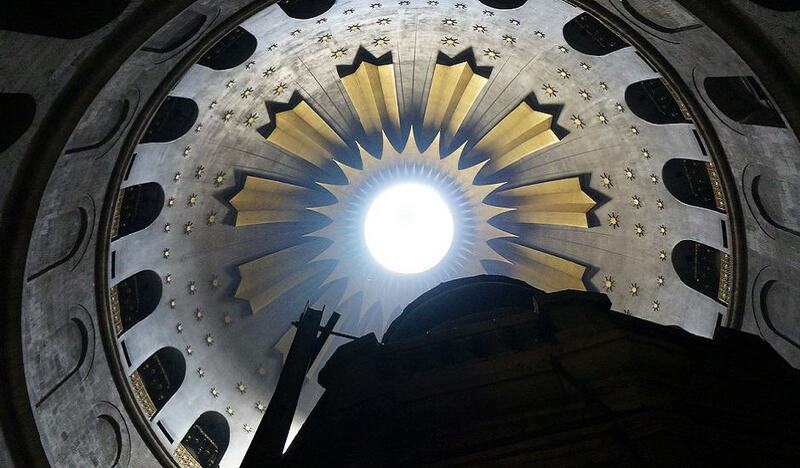 I’ve tried to fill in some of the questions I had when I visited but I’m not in a position to offer a blow-by-blow two day itinerary, mainly because half the fun is in deciding on the day what you want to do next. So I couldn’t manage the planning I wanted before visiting but I could definitely manage the early-rising. We left our hotel about an hour before the park was scheduled to open, which in my experience of other parks is plenty of time off-peak. We arrived at the security gates about 20 minutes after that and realised that everything I thought I knew about visiting a Disney park was wrong. We were confronted with the largest entry queue I’ve ever seen at a Disney Park (note: I’m an off-peak visitor). We waited in the queue for security for about an hour, got through the bag check and then waiting another 20 minutes at the ticket gate. I was pretty stressed by this point because we didn’t enter the park for an hour after opening, at which point a lot of the advantage of getting up early and beating the queues had vanished. The following day we got to security 90 minutes before opening, there was still a large crowd in front of us, and we made it into the park exactly at opening time. That day we also didn’t take bags with us and while there was some advantage to a faster security process, there was no line for people without bags. The security check really impacted my enjoyment of the parks. One of the things I appreciate about visiting the Disney Parks is the focus on ‘efficiency’ and this was totally lacking in the entrance process to the park. As it was my first impression of the park it left a negativity that was difficult to shake. I was caught out when it came to the FastPasses because it’s different (again) to the system in other Parks. 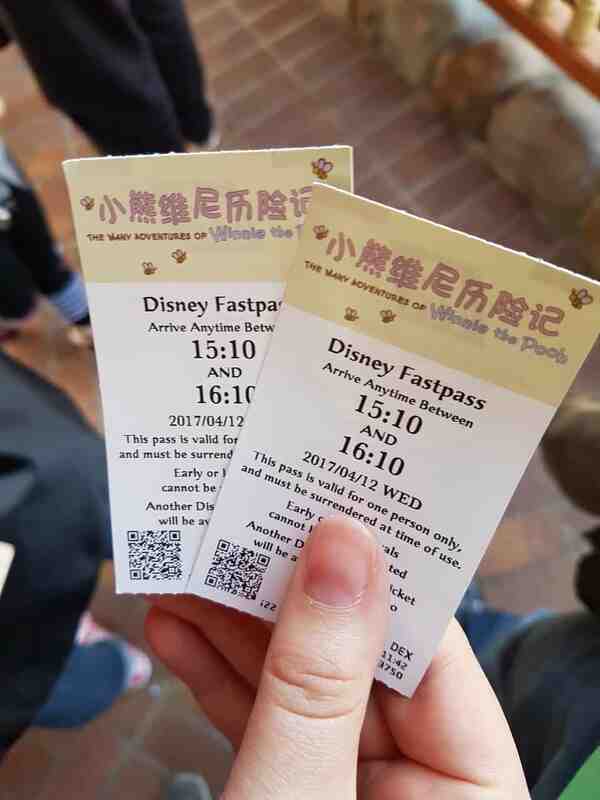 In Shanghai Disneyland there is one FastPass kiosk located at the guest services for each land that has FastPass rides (when I visited there was one in Tomorrowland, Fantasyland and Adventure Isle). These kiosks distribute FastPass tickets for all of the rides in that Land but only the rides in that land (you can’t get a FastPass for Tron from the Adventure Isle kiosk for example). 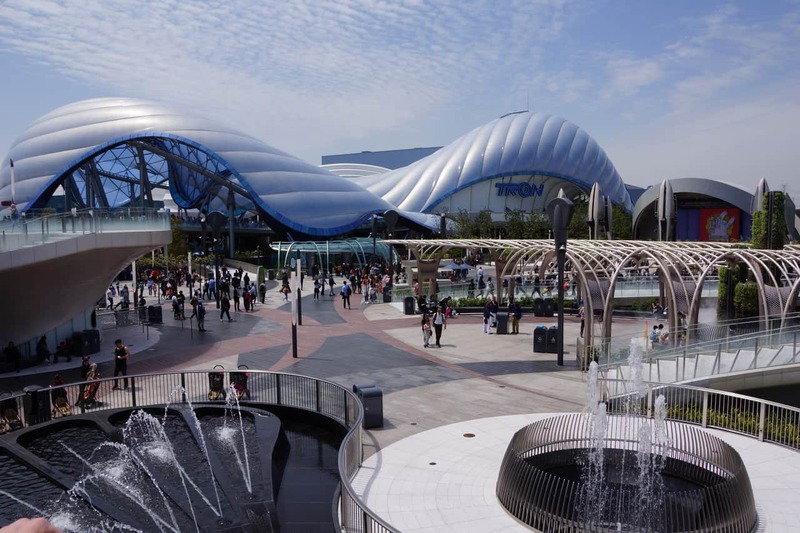 The popular FastPass rides are: Tron, Seven Dwarfs Mine Train and Soarin’. Conveniently they are all based in different lands, so you have to decide upfront which kiosk you are going to visit. On the first day we arrived too late to get a FastPass for any of the popular rides. However, we were able to FastPass both Peter Pan and Winnie the Pooh, which worked quite well for us. On the second day we joined the queue for Soarin’ FastPass approximately 10 minutes after the park opened, it took a further 10-15 minutes to get through the queue and our FastPass time was 15:00-16:00. In that time FastPasses for Seven Dwarfs Mine Train had been distributed. If you don’t manage to FastPass one of the popular rides then (based on the queues we experienced) I think it’s unlikely you’ll be able to ride them all. 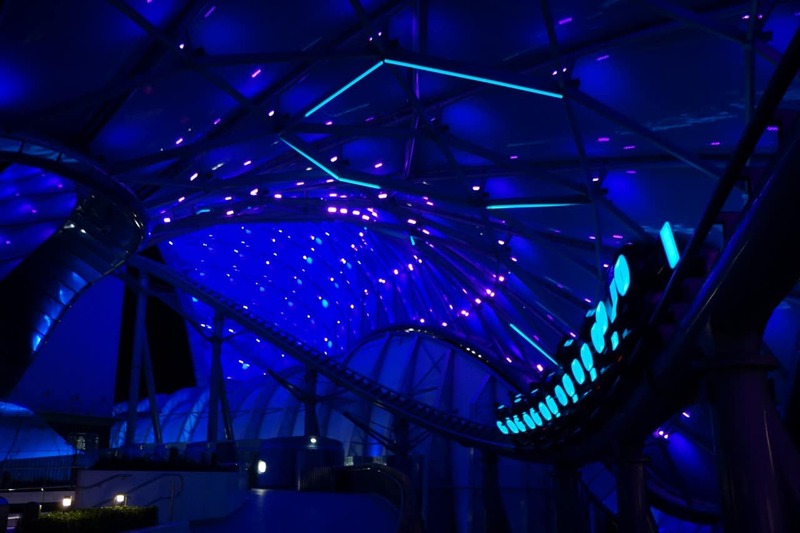 However, the Mine Train and Soarin’ are clones of the Florida rides so I’d recommend focusing on Tron for the unique experience (until it opens in Florida). Also remember that you are locked out of receiving another FastPass until your ride time comes around, when we took a Soarin’ FastPass we were unable to FastPass anything else that day. Note: Voyage to the Crystal Grotto was closed when we visited. All of the key rides had a long queue from open until close. Pirates generally had the shortest queue of about 45 minutes, all of the other main rides were over 90 minutes. Pirates of the Caribbean merges cutting edge technology with Disney imagineering to spectacular result – if you’ve been on Spider Man in Universal then it’s similar to that but on water. My husband hates simulators (I always have to ride Star Tours alone) but the special effects were subtle enough for him to not have a problem. I think the fact that the boat always stays level while the environment changes and moves helped create a sense of more natural movement. The technology allows for superb storytelling (even if it is in Mandarin) and I was genuinely delighted every time we went on the ride. 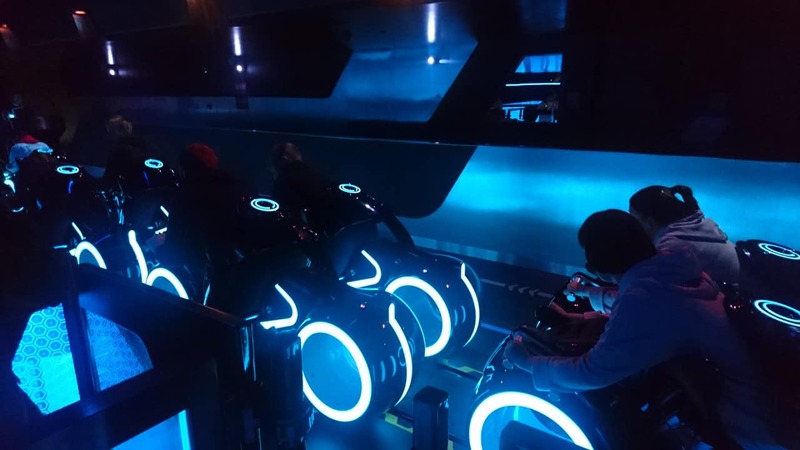 Tron is a motorbike roller coaster – you actually sit on a seat like a motorcycle. From what I’ve seen of Avatar Flight of Passage in Florida it looks like a similar concept to that ride seat. 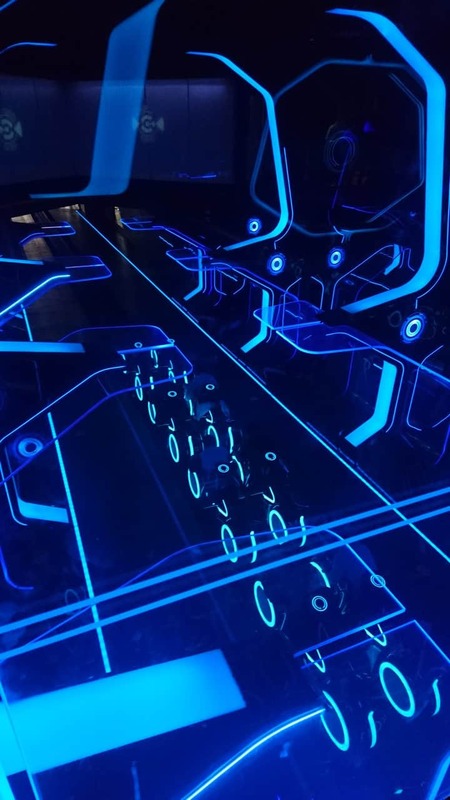 The last bit of the queueing system is really nice for Tron because you get sneak peeks at the ride launching, similar to Rock n Roller Coaster, and I think that adds to the build up. I think its biggest flaw is that it doesn’t quite provide for the avid thrill seeker, it didn’t leave my adrenaline pumping in the same way Rock n Roller Coaster does. However, the novelty of the motorbike carriages and the transition of the track through inside and outside still meant we went on three times and I can’t wait until it arrives in Florida and becomes part of my regular Disney holiday. From what I went on and remember, all of the rest of the rides were very similar to their counterparts in other parks. Queues for all of the rides were longer than I expected (nothing had a queue shorter than half an hour from when the park opened) and the park was very busy when walking around. During our two days we managed to get on all of the rides we wanted to (with multiple rides on Tron and Pirates) but it was tight. 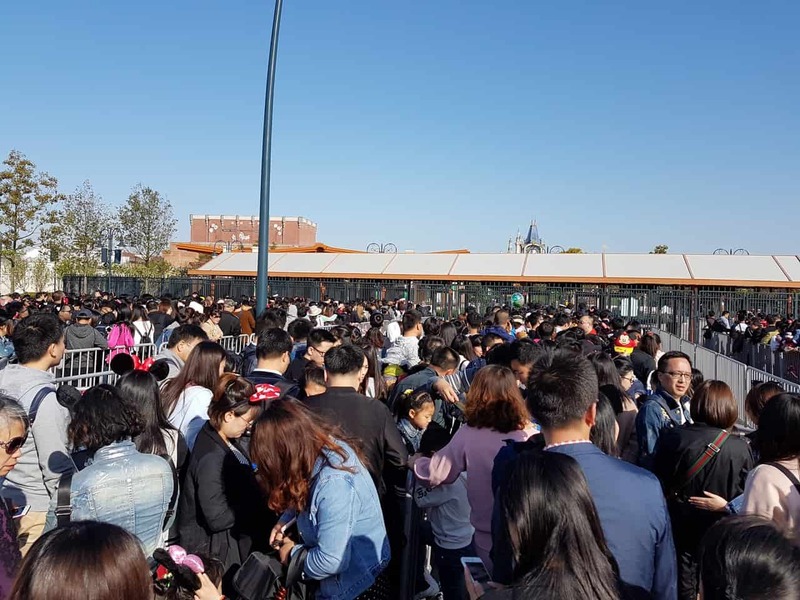 Due to the length of queues I don’t think you could manage everything in a day unless you were happy to just ride Tron and Pirates and see anything else as a bonus. We didn’t do any character meet-and-greets. These are normally low on my priority list in the park and from what I remember about the queueing times we weren’t incentivised to wait. If character experiences are important for your visit then you’ll have to be prepared to sacrifice the rides that you’ll be able to go on in two days. 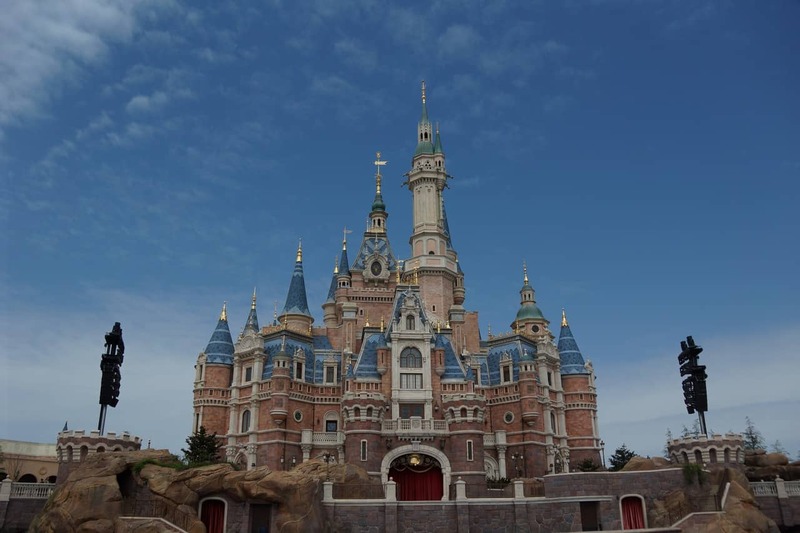 All the literature about Shanghai Disneyland proudly proclaims that the castle is the largest in any park and it’s easy to see that it isn’t just a technical distinction on paper. It’s huge – in every dimension. It contains a ride, walk through experience, princess meet-and-greet, Bibbidi Bobbidi Boutique and restaurant. It sets the tone of a visually stunning park that the rest of the lands live up to. 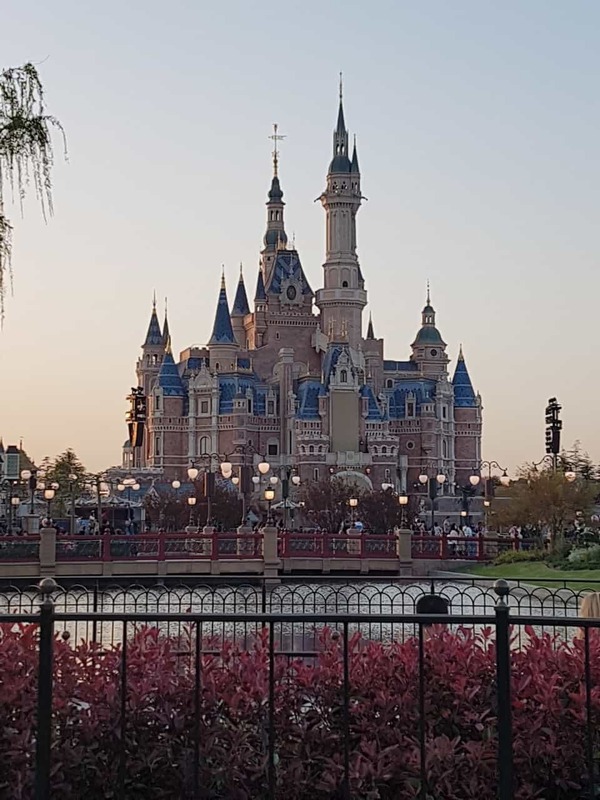 When I go to a park I might never visit again I really try to take in the details of walking around the park and Shanghai Disneyland had a lot to offer. 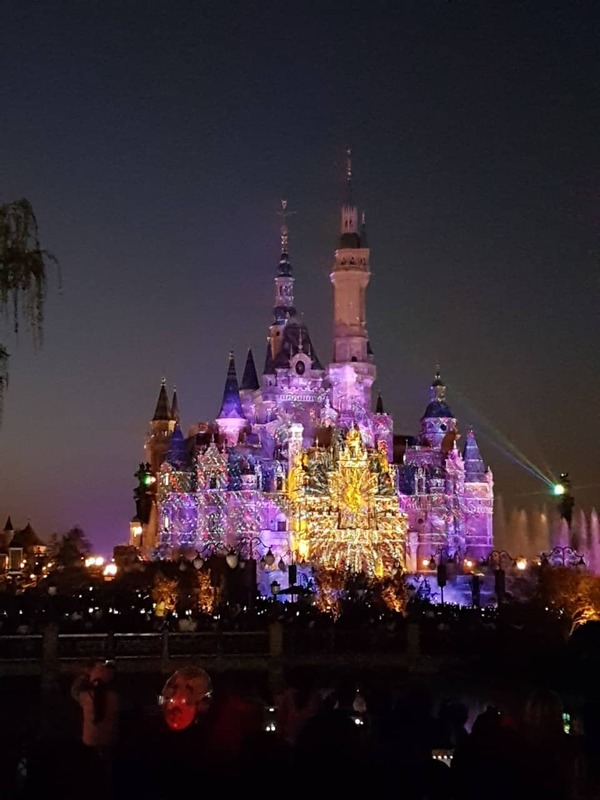 Garden of the Twelve Friends and Once Upon a Time are walkthrough experiences that it would be easy to miss but are fun to take the time to enjoy and add to the unique experience of Shanghai Disneyland. Tomorrowland and Treasure Cove were my favourite lands due to the attention to detail and ease of navigation. 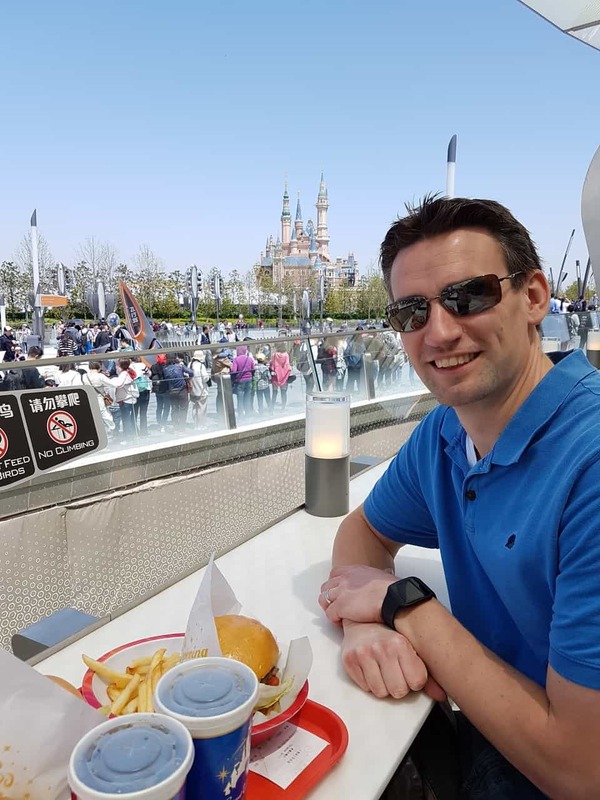 On our second day we enjoyed slowing down for lunch at the Stargazer Grill which had a lovely outdoor terrace overlooking Tron and Tomorrowland. We also skipped the parade in the hopes of getting on the rides during the quiet times. We caught parts of it and it looked like a fairly standard parade, possibly with newer more elaborate floats but not really anything more than the parks we visit more frequently offer. 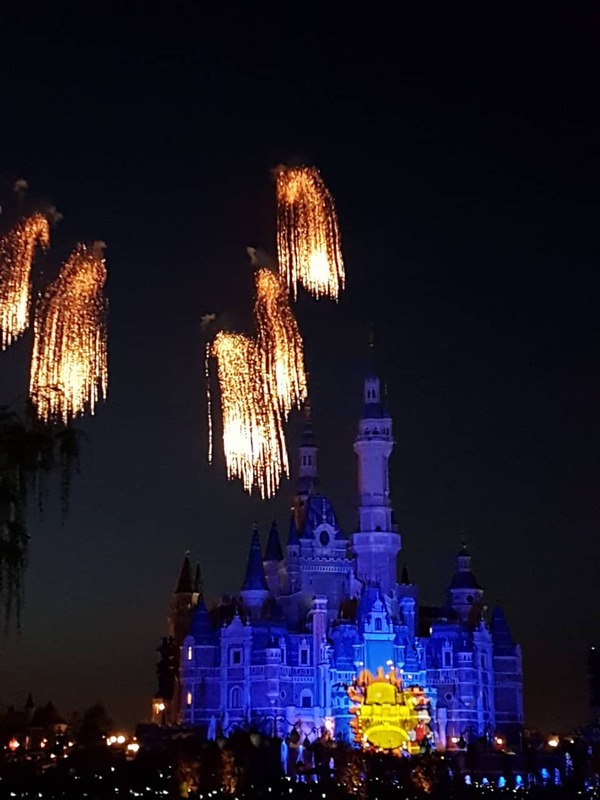 My favourite way to end a day in a Disney Park is with a show or firework display and I had high hopes for Shanghai Disneyland as it was built in the home of fireworks. I was sadly disappointed though. 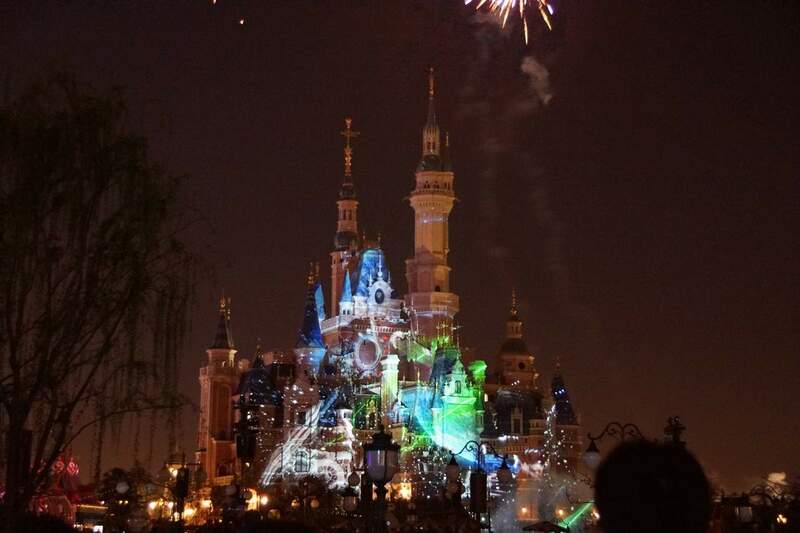 Instead of fireworks the evening show focused on projections onto the castle coordinated with the fountains and Disney music. There were some fireworks but not many more than you see in the photos on the website. This does seem to be the way a lot of the nighttime castle shows are heading in Disney Parks but I think there needs to be a balance between Castle illuminations (where you have to have an unhindered view) and fireworks (which can be enjoyed from more obscure viewing points). Shanghai Disneyland didn’t quite get this balance right for me. But it did mean on the second night we could leave and skip the crowds. If you are looking for a good place to watch the evening show from, I recommend the side of the Gardens of Imagination that leads to Tomorrowland. Just before you get to Mickey Avenue there’s a side exit that leads to Downtown Disney and you can escape the worst of the crowds (always my least favourite part of any Disney Parks day). Ros loves to travel far and wide. A lot of her holidays have been influenced by her love of Disney and she's visited every park worldwide (some several times). Her favourite holidays are self-drives, particularly if it involves a coastal road or rolling landscape. She has an ambition to visit every State in the USA and every country in Europe.